I had the great fortune of meeting John just before he retired from the chief deputy post at the Waldo County Sheriff's Office. John had previously retired as sheriff of the agency, but had returned to help out after the untimely death of then-Sheriff Bob Jones. During the interview for a story about his career, the comedian in uniform rattled off one hysterical story after another. Nothing, and no one, was spared. A couple of hours later when I left — clutching my stomach because it hurt from nonstop laughing — I suggested to John that he should write a book, or go on tour. Instead, at least initially, he agreed to share his tales every other week in the local paper. Thousands of people in Waldo County and beyond enjoyed his heartwarming columns about how he rehabilitated Bucky the Deer, Wile E. Coyote and Boo-Hoo and Who-Hoo, and they raced through his heart-pounding tales detailing his pursuit of gun-toting criminals on Moody Mountain. I admired that in his award-winning, laugh-out-loud columns, John also was willing to share his mishaps — falling off a plane pontoon into a pond, eating spiders out of a bag of popcorn, blowing up taxpayer property with dynamite and soiling his snowmobile hood. I'm thrilled and thankful John is publishing another book of (mis)adventures. But most of all, I'm grateful for his friendship. And I do have hope that one day, he will kick off a comedy tour. Or star in a television series. John Ford is one of the funniest people I have ever known. And I am serious about that! Despite years of dealing with the most unpleasant sides of human nature in his careers as a game warden and sheriff, he has never lost his faith in humanity or his sense of humor. The stories he shares in his books are laugh-out-loud funny, touching, surprising and make for great reading. I particularly like the fact that John’s stories are accessible to anyone from a school dropout to someone with a doctorate. Anyone with even a tiny sense of humor will love John’s down to earth, frank tales. 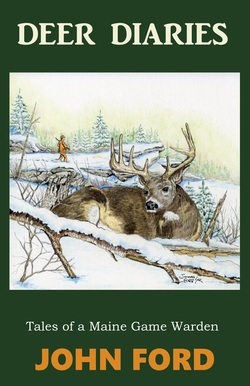 If you have read his “Cider” books you know the pleasure that is in store for you in Deer Diaries. If you are a new reader you are in for a wonderful treat. I am proud to call John a friend, neighbor, and marvelous writer. His storytelling is superb. 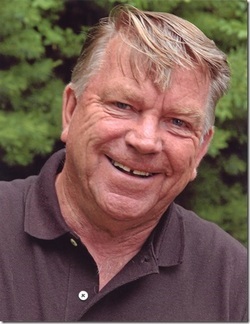 John's writing career came about thanks to Republican Journal editor, Beth Staples, who convinced him to do a bi-weekly column of actual events and stories recorded from the daily diaries of the young lawman's career. Keeping a diary was something John’s step- father encouraged him to keep when he first joined the agency as a Maine Game Warden. John has previously written two books, Suddenly, The Cider Didn't Taste So Good and This Cider Still Tastes Funny. Deer Diaries--Tales of a Maine Game Warden, is now the third. Each of them are filled with actual events and experiences, written as short stories, mostly humorous in nature, of the many great experiences the young game warden remembered the most. John lives with his wonderful wife, Judy, in Brooks, Maine.